Our place lies directly on the beach in front of a peaceful, idyllic fishing village named Kalamos. The small village is located at the foot of a green hill with olives- lemon- and orange-trees. It is surrounded by many quiet swimming bays with clean white pebbles and sand, picturesque cliffs and the clear turquoise blue waters of the Aegean Sea. From the open dining terrace we have a wonderful panoramic view over the sea. You can experience the most beautiful sunsets under the evening meal. Every now and then dolphins swim past. 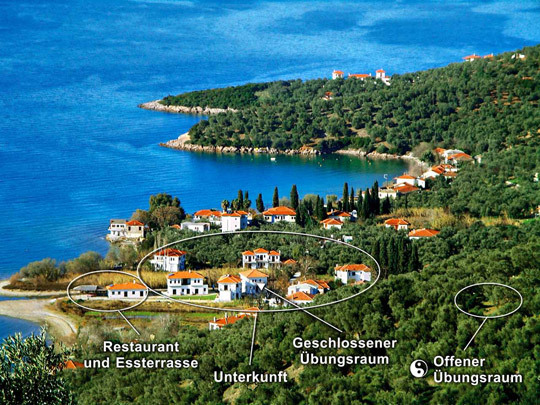 The ILIOHOOS Center lies directly on the beach, at the edge of the small village Kalamos of southwest Pelion. Six kilometers away from Argalasti village (by asphalt road with taxi ca. € 7 or £ 5).The distance to Volos is approximately 40 km. In the village there are cafes, tavernas and a small shop. Horto: 5 km from Iliohoos, lies the picturesque seavillage Horto. In the village there are cafes, tavernas and a small shop. Milina: 7 km from Iliohoos, holiday village with a beautiful beach promenade, cafes, tavern, market. Argalasti: The biggest village in Southpilion ca. 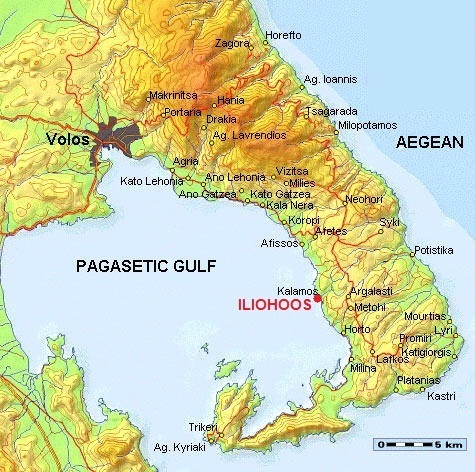 2.500 inhabitants, 4 km from Iliohoos (journey by taxi about 7 €). There are tavernas, supermarket, bakery, shops, hospital, post office, ATM machine. On Saturdays there is an open market with organic products. Daily buses run between Argalasti and Volos (Argalasti-Volos: 40 km) and Southpilion. The rooms have a sea view and private balcony or terrace. 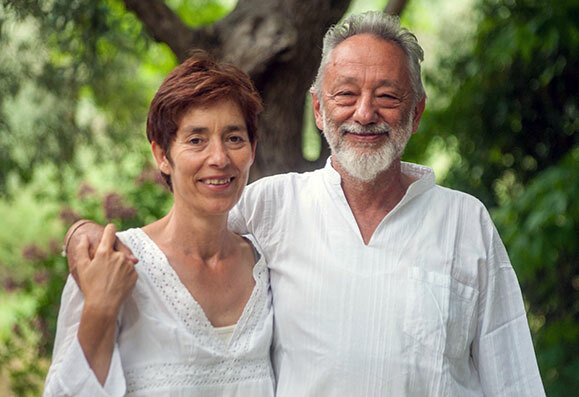 The wooden furniture is carefully chosen to make the accommodation comfortable and enjoyable. All rooms are equipped with bathroom, shower, toilet, refrigerator, air conditioning (extra charge), hairdryer, TV, telephone, internet and safe. If our hotel is not sufficient for all participants, we offer comfortable rooms or appartments in the vicinity (about 3 min walk). Breakfast and dinner are held on a terrace right on the beach. There are home-made olive oil, honey, jams and wine. Fresh vegetables and fruits from the area. 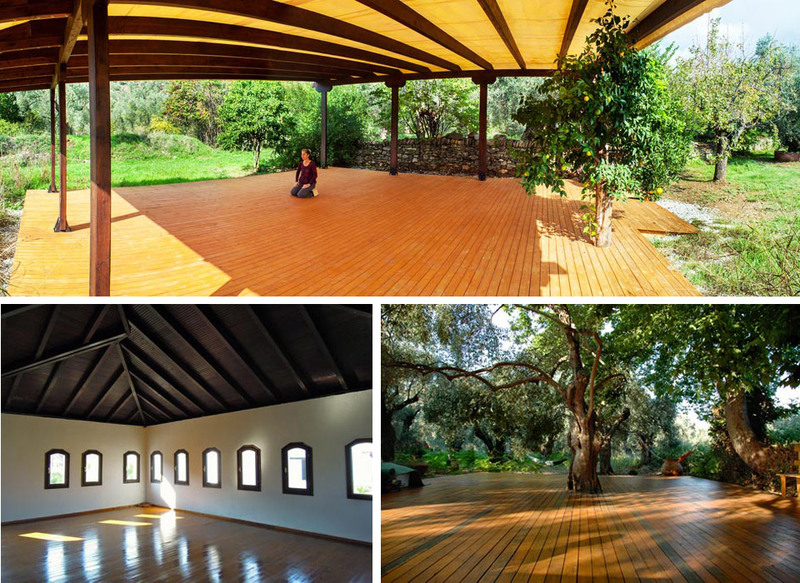 There are two exercise rooms with wooden floors in the open air surrounded by olive groves. Nearby is a small river. Practicing in the natural shade of plane trees and olive trees. It is very quiet there, you just hear the ocean waves and the chirping of birds. The hotel also has a closed exercise room with 60 sqm on the first floor, many windows, overlooking the sea, air conditioning and wooden floors. All given values are meanvalues (the temperature at midday can be significantly higher).